Kinzler Safety Director Bruce Moore accepts the STEP Award for Safety at the Associated Builders and Contractors of Iowa Excellence in Construction Gala. 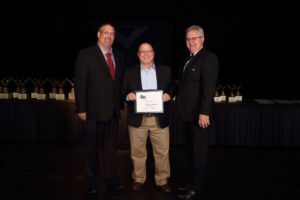 Associated Builders and Contractors of Iowa (ABC), a national construction industry trade association representing more than 21,000 members, congratulated Kinzler Construction Services for recently being named a Silver Safety, Training, and Evaluation Process (S.T.E.P.) award recipient at their Excellence in Construction Gala. The recognition comes just weeks after Kinzler Construction Services announced that their employees have worked more than one million safe man-hours and have gone more than two years without a loss-time injury at any of their six branch locations. Located in Ames, Ankeny, Cedar Rapids and Waterloo, IA as well as Fridley, MN and Tyler, TX, Kinzler Construction Services is a leading installer of insulation products and also distributes construction materials.